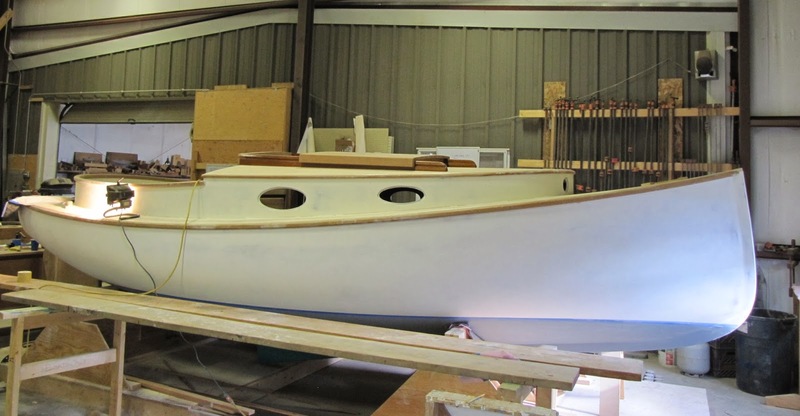 Welcome aboard Pleasant Bay Boat and Spar Blog, a virtual log of boat building discussions, on the water adventures, spar talk and sharing our passion for traditional craftsmanship. Days away from painting there's still so much to do. We opted to paint the boat with a two part Awlgrip paint system. While it is more labor and materials-intensive and expensive up front, we decided that in the long run it will serve the owners well. The durability of the material alone will be a huge savings on yearly maintenance. But the main reason to go with Awlgrip: compatibility with the epoxy cold-molded process. We'd seen enough paint failure and print-through on past projects which were smaller in surface coverage and therefore not as significant to repair. This hull has volume! Add to the volume all the deck hardware, cabin trim and do-dads and repainting this boat would be a horrible annual chore. So that settled the argument! Today, Brian, Seth and Tait sanded, puttied and re-sanded every spot on the hull in preparation for painting tonight. The boat has been taped off. The shop has been cleared out in case of over-spray. This will be the final finish after thirteen months of hard work. The second coat has been sprayed on. Brian's mixing up the third coat batch. He's added a flattening agent to subdue the gloss a bit. It is a catboat after all. That is haze from the over-spray. Needless to say, we're all out of there. Brian is suited up with full face respirator. Fans will deploy as soon as the last coat is applied. Second coat; two more to follow. Tomorrow will be the proof. There's always another coat if we're not happy. From my perspective, it's probably going to be good enough. That's always the defining moment in a shop like ours; just how good should it be? Looking down on the cockpit, I get the sense that this boat is going to be loved, sailed well, full of family and friends all enjoying the day out on the boat. That is the main thing in the end.